Ten-foot-wide doors opening onto the balcony immediately draw attention to the harbor view. 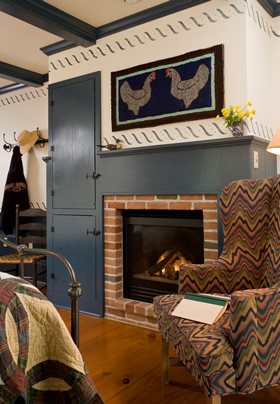 A queen iron bed with wedding ring quilt and naively composed hooked rug over the fireplace welcome you. The massive tiled shower and dressing-table-style wash basin make the bathroom handicap accessible.